The Louisiana Uniform Local Sales Tax Board held its regular meeting at the LMA Building, 700 N 10th Street, Baton Rouge, LA 70802, on Thursday, June 14, 2018 at 10:00 am. The following board members were in attendance: Donna Andries, Greg Ruppert, Amber Hymel, Tiffani Delapasse, John Gallagher and Mark West (Proxy for Roland Dartez), Amanda Granier (Proxy for Scott Richard). Absent: Mike Ranatza. • Motion by Tiffani Delapasse, seconded by Amanda Granier to approve the Board minutes of the June 7, 2018 Special Board meeting. Item unanimously passed. o Introduction of JA Cline as a contract consultant for the Board that will be working to develop policy and procedures for the Board to operate in accordance with state law and legislation. Mr. Cline is charged with drafting and developing programs with guidance from the Executive Director and the Board as it pertains to any VDAs, Refund Claims, etc. which will give taxpayers the opportunity to address issues for multiple parishes in one location, being the Board website and/or office. He will also be responsible for the promulgation of rules for the Board. o The upcoming third special session starting Monday, June 18th was discussed. Mr. Bergeron will be monitoring the session to ensure that anything affecting the Board and/or local collectors will be addressed. o It was also determined that the previously obtained PO Box was located in the capitol post office location which is not an ideal location as the Board does not currently have a home office location in the area. Mr. Bergeron will get a PO Box in Port Allen in the interim until the Board finds a more permanent office location. o Mr. Bergeron will also develop a strategic plan with assistance from Greg Ruppert in order to meet the July 1st deadline as required by the LA Department of Administration. • Representative Julie Stokes took a moment to recognize the Board and the accomplishments and strides they have made since inception and that they continue to make. She also extended congratulations to the newly appointed Executive Director, Roger Bergeron and contract consultant, JA Cline. Representative Stokes also spoke to the topics that are expected to be addressed in the next Special Session and her plans and hopes for the outcome.  A motion was made by John Gallagher and seconded by Amanda Granier to discuss updates made to the budget by the Executive Director. The motion was passed unanimously. o The budget was adjusted to correct the deductions for the employee and employer’s MERS amounts. It has also been updated to reflect the Executive Director opting out of the Board retirement plan offered. The last update was made to reallocate funds for Administrative Assistant Salary to that of Consulting Services.  A motion was made by Amber Hymel and seconded by Tiffani Delapasse to adopt a policy for travel reimbursement for Board members. 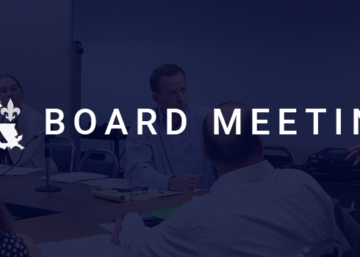 o Board Discussion: It is requested that the Board reimburse members for mileage in order to attend the meetings and functions according to the policy previously developed that applies to Board employees. Also to apply the policy retroactively to reimburse previous expenses only to the point the member was previously reimbursed by their employers. • The policy will also extend to any proxy for a Board member. o Motion was unanimously passed by the Board.  A motion was made by Tiffani Delapasse to add to the agenda the discussion of the development of a multi parish filing software. Seconded by Amber Hymel. Motion was approved by a unanimous roll call vote. o Greg Ruppert would like to create an RFP to call for the creation and development of a multi parish filing software to possibly replace the current options available to taxpayer’s. The software would be owned by the Board and made available on its website. o The software would be for both remote sellers and brick and mortar locations. It would apply to all taxpayers. • Motion by Greg Ruppert to develop an RFP for the previously discussed software program and seconded by Amanda Granier. Motion was unanimously passed. • A motion was made by Amber Hymel and seconded by Tiffani Delapasse to adopt a holiday and leave policy for Board employees. o The motion was amended by Donna Andries to also include vacation leave. o The item was deferred until a future meeting so a policy can be reviewed and developed in more detail. Item unanimously passed by the Board.  Amanda Granier motioned to enter into executive session to discuss current litigation with counsel. John Gallagher seconded the motion and the board unanimously approved.  The Board exited Executive Session at 12:42pm by way of a motion to exit by Amanda Granier, which was seconded by John Gallagher and unanimously approved by the Board. Motion to adjourn at 12:42pm was made by John Gallagher and seconded by Tiffani Delapasse and unanimously passed by board.